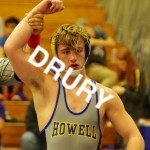 Dylan Komperda - Drury - Purler Wrestling Inc.
Superior Athlete award given at St. Louis Wrestling Officials Association for being a state finalist. Most Improved wrestler award class 4 given at St. Louis Wrestling Officials Association. One of 5 finalists nominated for Junior wrestler of the year.